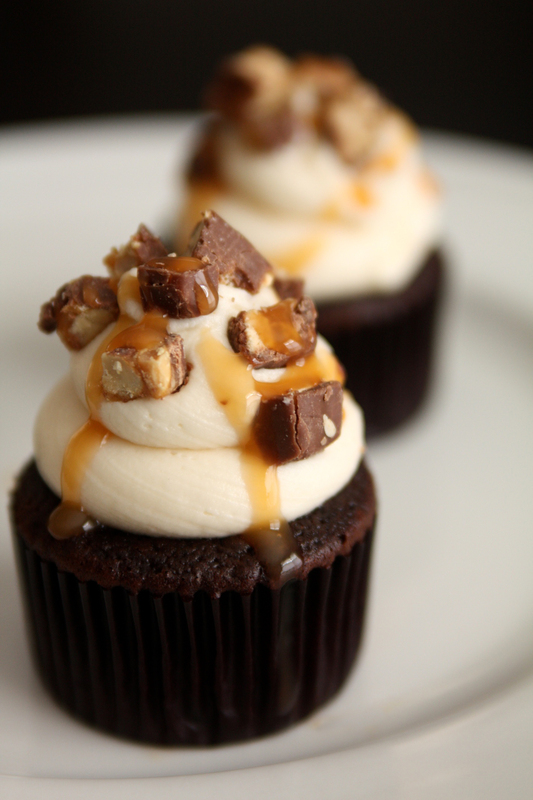 These Snickers Cupcakes were inspired by a recipe from My Baking Addiction. The recipe uses a cake mix so it is super easy! I made a few changes to the cake and cupcake centers, but the frosting stayed the same. Delicious! Preheat oven to 350 degrees F. Line 24 cups of muffin tins with paper liners. In a large bowl, mix together the cake mix, oil, eggs, water and mayo. Spoon batter into the prepared pans. Bake for 18-22 minutes, or until center is set. Cool cupcakes thoroughly on wire rack. Cream the butter and shortening in the bowl of an electric or stand mixer. Add vanilla, salt and caramel syrup and combine. Begin adding in the sugar and mixing thoroughly after each addition. Once the cupcakes have cooled, fill a pastry bag with a small tip. Push tip through top of cupcake and fill. If you want something extra yummy push small piece of snickers bar into the filling. Frost cupcake tops and garnish with chopped Snickers bars and a drizzle of caramel of caramel syrup. Best. Cupcakes. Ever. for real. You are too sweet. I’m lovin’ my cake. I might have eaten some more.